In autumn I find myself drawn to the displays of fresh seasonal plums, adoring their shape and colors. Strawberries are my spring darlings, blueberries are our summer sweet, and plums are my fall favorite, a delight that my boys enjoy as much as I do. I brought home a few bags of plums last week with this ginger plum jam in mind, and I had a hard time protecting them from the boys for a couple days until I could make the jam. Top Gun especially is drawn to their deep color, and I would find him sneaking off with one every so often, and even discovered a plum pit under the living room sofa. He desperately wanted that plum all to himself. Fortunately there were plenty of plums leftover for him and his brothers. We have our own plum tree now, a new acquisition this fall. It’s called a Sweet Heart Plum, and the only information I could find on it is a copy of the original patent filing, which states it’s a relative of the Casselman Plum. We chose this one because it’s self-pollinating and we’re running out of room for fruit and nut trees in our yard. Hopefully in a few years our plum tree will give us a harvest of our own. 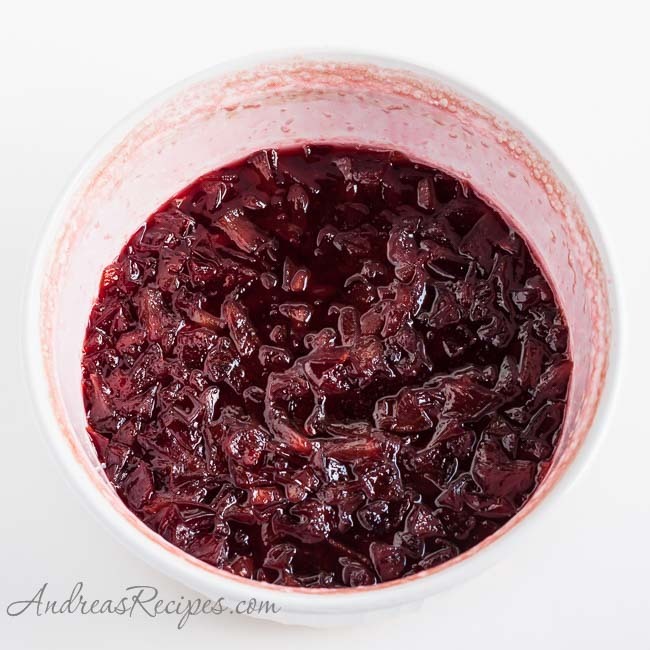 This jam is so simple to make you will hardly believe you are canning, and you really don’t even need to can it, you can freeze it if you prefer. 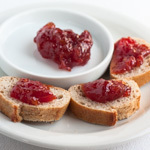 In just 20 minutes you will have hot plum jam ready to can or freeze or enjoy later after it cools. This is a small batch, yielding just a few cups, but that makes it easy for home cooks who want to try canning for the first time or don’t have bushels and bushels of fruit to process. You can also double or triple if you like and cook it on the stove. 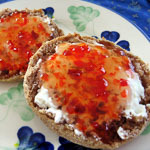 The jam makes a beautiful spread for breakfast breads or a delicious layer in a cake, and can also be melted and turned into a sauce for grilled or roasted meats. 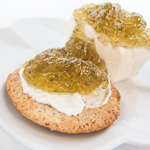 The candied ginger adds another layer of flavor that makes me want to eat it with a spoon straight out of the jar. 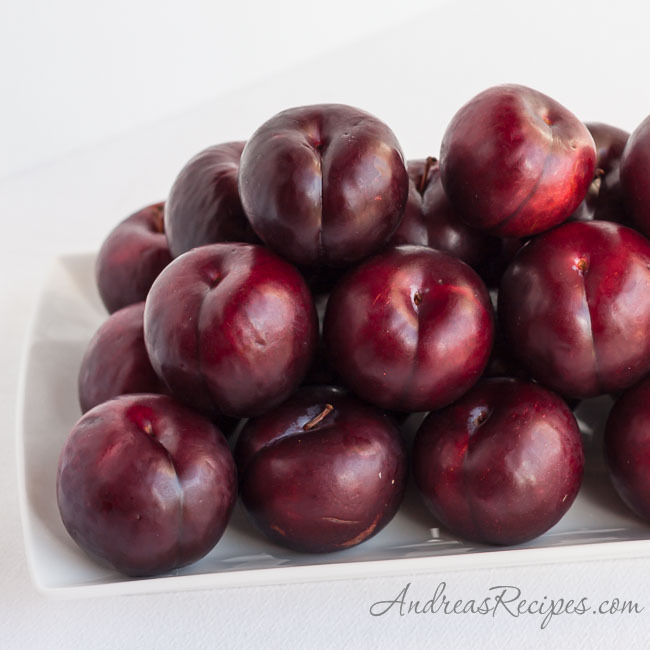 Plums have a high pectin content, so you don’t need to add any pectin to get a good gel. This recipe is written for the microwave per the original, but I also included instructions in the Variations for stove top cooking. The original recipe says it makes 2-1/2 cups, but I get 3 cups plus a little extra, so your result may vary somewhat. I always keep a 4 ounce jelly jar on hand for any extra and put it straight in the refrigerator. You can find information on preparing jars and processing jams, jellies, and other high acid foods in my post Home Canning (Boiling Water Method). With the ginger and plum, this would make a great finishing glaze for an Asian style pork rib! Hello Andrea, What a delicious looking plum jam. I must admit to being a bit jealous that you have your own plum tree. It’s not hot enough where I live to successfully grow plums. 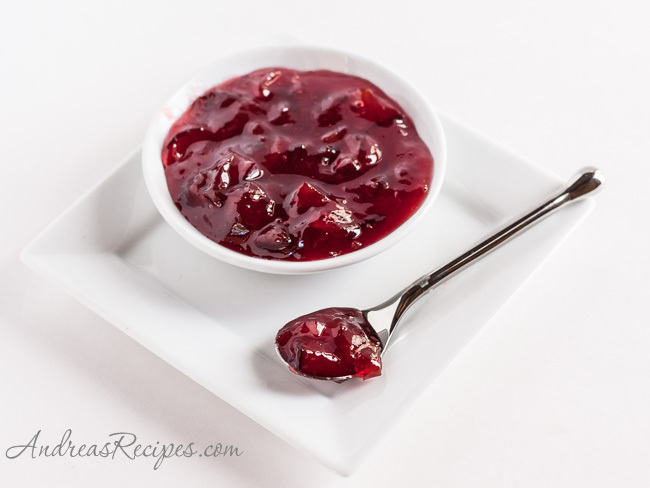 Thanks so much for the link to my plum jam recipe. It is indeed simple to make, isn’t it? Oh my goodness Andrea, that looks simply divine. Of course, I can never have enough ginger! Your own family plum tree? How lovely! And so too is your jam. What a beautiful photo. The combination of ginger and plum is a match made in heaven and perfect for the autumn season. Being diabetic, I think I’ll skip the sugar and try using splenda instead. This looks delicious. Will definately try this out. I’m also planning on planting some plum trees for my “liitle orchard” next year. 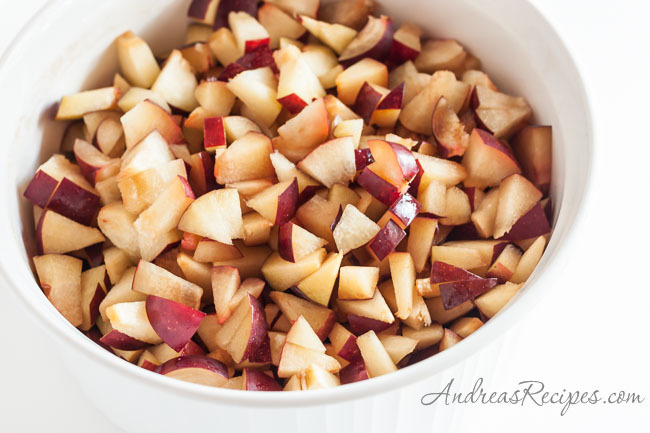 Hi Andrea ~ I love plum and ginger together! But I usually find jams and jellies too sweet for me. What’s the least amount of sugar I can add and still have the jam hold together? Thanks! Hi Mary. Though I have not tried this myself, I think you could probably reduce the sugar to 1-1/2 cups and still get a good gel.